A bitter beverage brewed from the leaves of the Yerba Mate has been circulating Paraguay, Argentina and Uruguay from before the Colonization. Drinking mate has become a kept tradition of the Guarani Indians, carried out in a ritual and collective form. Popular belief states that the Guaranies planted Yerba Mate on the burial sites of their loved ones. As the plant grew, they collected the leaves and brewed mate with it which they shared in a round with their families. It was their belief that the spirit of their deceased would grow with the plant and seep through the beverage into their own bodies. Many other legends exist around this infusion drank from a calabash gourd through a metal straw, but despite diferent versions it has allways been a tradition valuing the preservation of the culture and sharing amongst the community. Throughout the colonization, the many cultural and social changes, and the large waves of immigration that the country has gone through, this custom has remained and has been adopted to a larger or lesser degree by all, having become a symbol of local identity and really keeping a piece of the Guarani alive. The mate culture has many peculiarities, such as considering the first fresh mate to be the “fools mate” because it is still too bitter. The custom of sharing mate in a round has also been kept and has made this drink more than just an antioxidant packed infusion. Rather, it is a tradition which brings people together to share a beautiful and ancient ritual that comes from the land. Would you like to know how to brew your own mate? Click here. 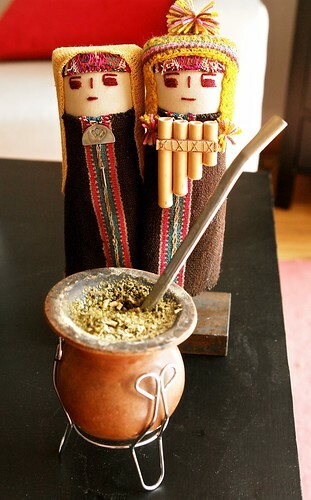 This entry was posted in Argentine Culture, Food & Drink and tagged argentina, buenos aires,, cultural identity, drinks, fierro hotel, guarani culture, indigenas, mate, south america, tradition, Travel by Fierro Hotel Staff. Bookmark the permalink.